wow!the moon appears so near,like half an idli. Got idli in SriLanka too?I thought it's an exclusively south Indian dish! 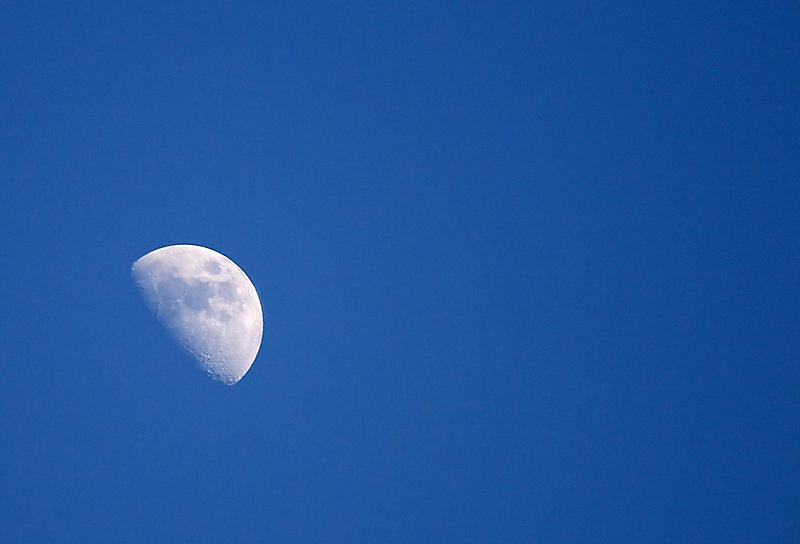 I think I have a post of the moon in the same phase too...but its not as crisp as this one. I guess this was taken around 6 in the morning, right? Fantastic, with great details on the moon! Wow.. can see the craters so well! Tell you the truth I’m bit confuse about this X factor as well. It says 70-300mm lens got 4.3x zoom; which I don’t think will be the same case as in the point and shoot cameras. Thanks for the comment. Hehe! Ya I looks like a half an idli :D and yes it’s not an Sri Lankan dish , but I know there are lot of Indian restaurants around here in Sri Lanka.